This song is a conversation across time between a present-day, reasonably happy and well-adjusted protagonist and his pseudo-suicidally-depressed earlier self. The mature version reaches back over the decades to hopefully assure the younger version that circumstances can and will get better. But there’s a subtext that darkness—and the neurochemical reality of depression—lurks in the shadows, and can return unexpectedly if not managed. Below are the lyrics. You may also see these in the context of the song if you enable closed-captions in the video above. Ode to a sleepy little village in Western Massachusetts. Three Rivers is a sleepy little village in Western Massachusetts, a few miles down the road from where I live. 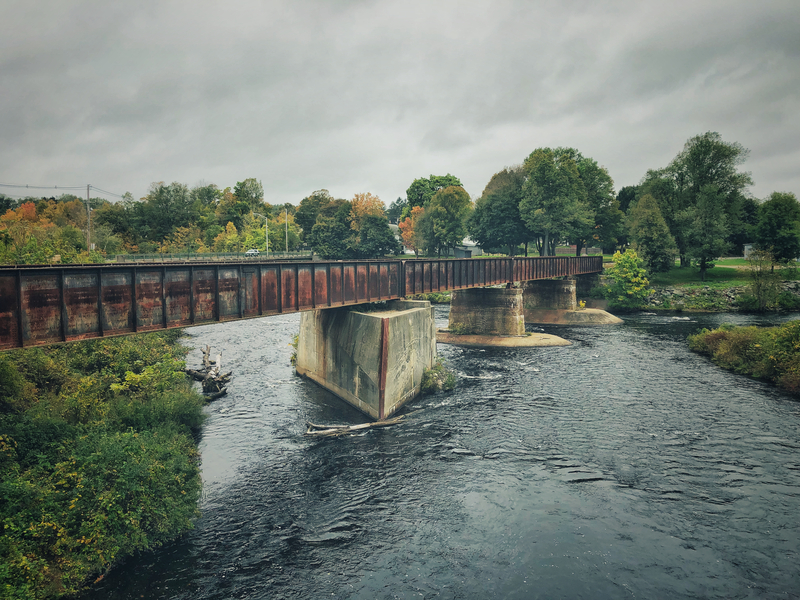 Right in the middle of the village, the Ware River and the Quaboag River (pictured above) flow together and form the Chicopee River, thus giving the place its name. I’m not sure why it wasn’t called “Four Rivers”—less than a mile away the Swift River flows into the Ware River. Recently I had some business to do at a nearby hospital. As a result, I had occasion to pass through Three Rivers a few times over the course of a month. I took advantage of the opportunity to get out on foot, and I explored and reminisced a bit. I wondered again what I ever saw in the place. One could say that Three Rivers is a bit depressed, economically and culturally. There’s not much going on here. There are many seemingly empty storefronts. But the local liquor store seems to stay afloat. 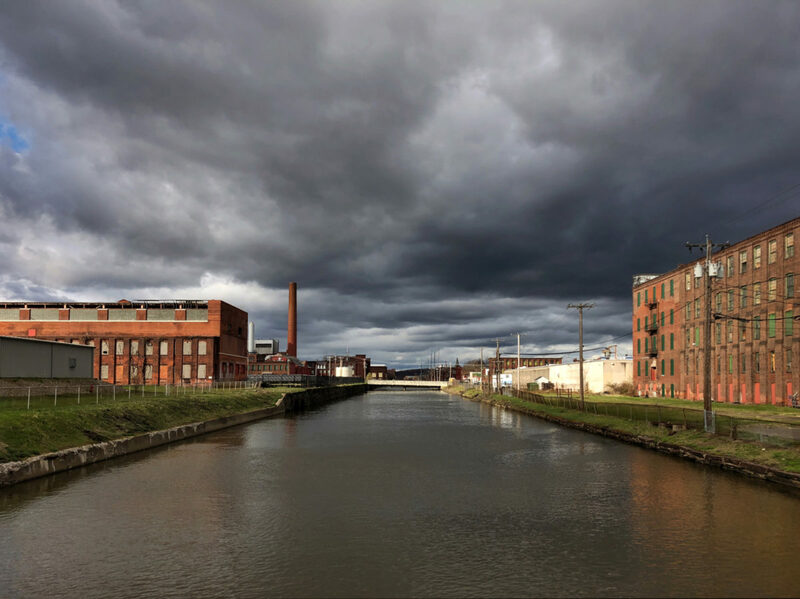 Like many towns in the area, it sports a couple of dilapidated 19th century mills that mingle with modest homes and tenement houses in varying stages of disrepair. But as unassuming and downtrodden as Three Rivers is, there is still something magical about it. I mean, come on—the place has three rivers in it! (Four, if you count the Swift.) And it’s somebody’s hometown, so it must be special. I’ll bet there are many people living here who actively appreciate the lack of culture and hubbub. 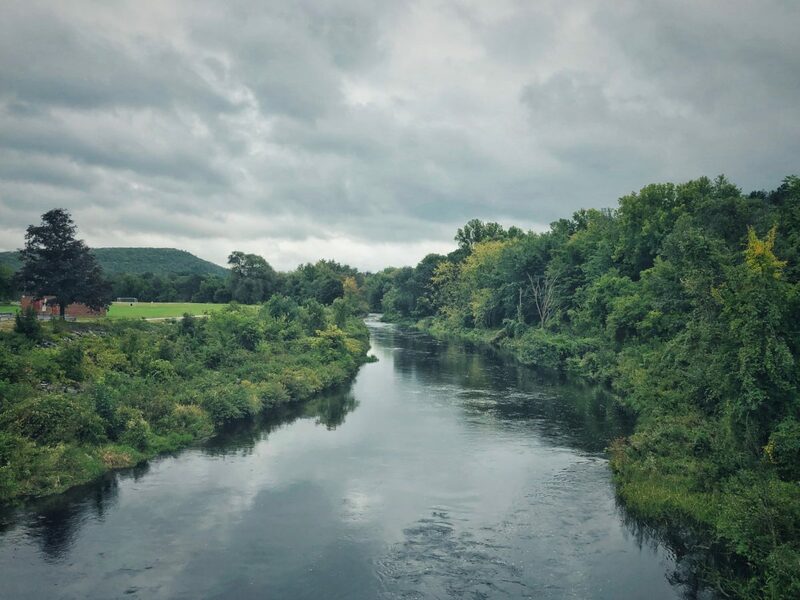 A few miles downstream the Chicopee River flows into the Connecticut River, which eventually flows on into the Atlantic Ocean. The Atlantic Ocean evaporates, and it rains in Three Rivers. The cycle repeats. It’s all one water, really. In May we had an opportunity to visit family in Independence, Missouri (a lovely place, and the hometown of President Harry S. Truman). There were plenty of sights to see and things to do around town (“the Square”—#lovethesquare), but on one of our days we drove west for two hours to Strong City, Kansas. There, we took a tour of the Tallgrass Prairie National Preserve. Our guide told us that we might see some American bison (a.k.a., buffalo) roaming around. As our schoolbus-style tour bus crested a hill, we were treated to this surprise. 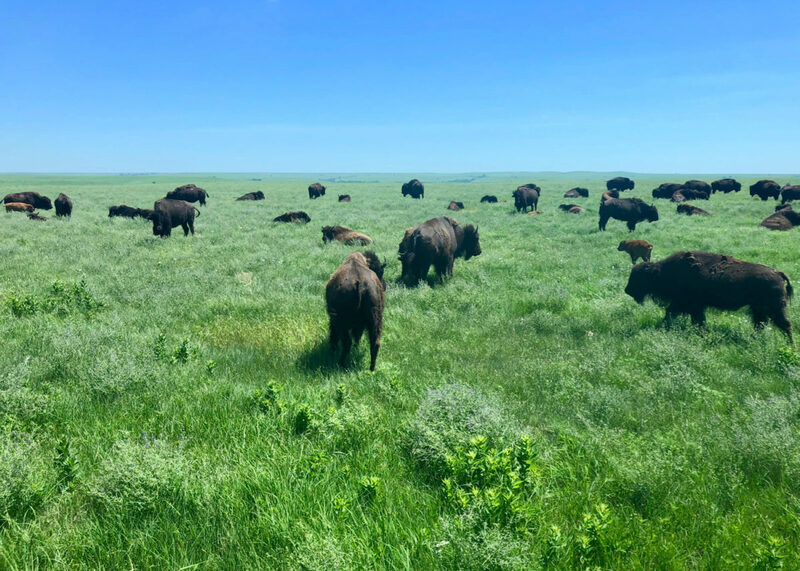 A twenty-five-mile view and a herd of more than two dozen bison lolling around in the Kansas sun. The prairie is awe-inspiring—thank goodness for the National Park Service for protecting this swath of it. If you have an inclination or an opportunity to check it out, I recommend it. 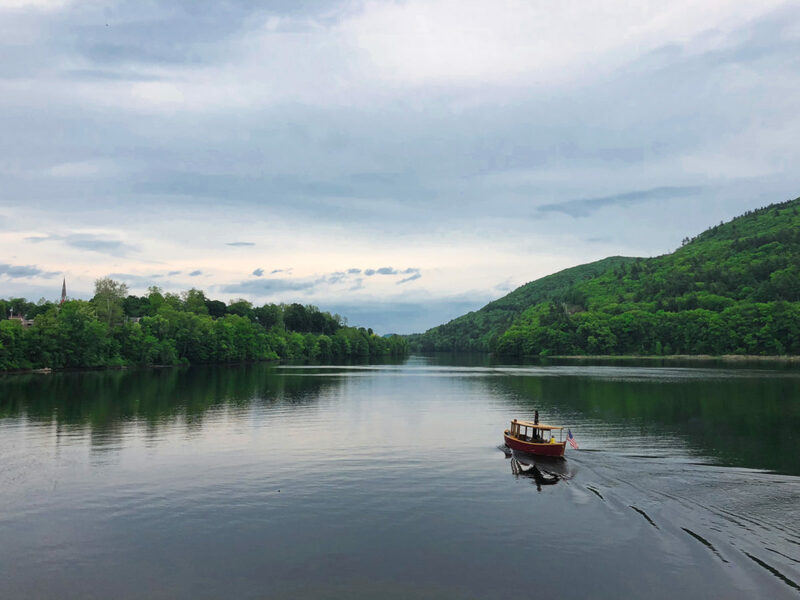 We took a nice day trip up to Brattleboro, Vermont for lunch and some sightseeing. We walked down to the bridge that crosses over the Connecticut River into New Hampshire. In fact, technically we were in New Hampshire when I took this photo. I had set up to take a nice landscape shot with my iCamera. I heard a boat motoring upstream under the bridge, and my initial instinct was to take a photo before the boat came into my field of view and disrupted the natural scene. But when I heard the boat sound its old-timey steam whistle, I thought that it might be a quaint addition to the composition. And it was—how fortuitious! I waited until the boat reached a perfect position in the scene (near an intersection of thirds, naturally), and took the photo. I lightly edited this shot in Luminar (which I’ve been loving lately), to unify and balance the light, bring out some of the color and subtlety, and to impart a bit of a magical, film-like look. This was an interesting year in terms of weather. Winter wasn’t particularly harsh, and there wasn’t as much snow as there had been in previous years. But April was brutal and damp. People seemed to be ready for spring, but Mother Nature had a different plan. Just as we were beginning to dust off our bicycles, hiking shoes, and gardening tools, multiple snow squalls and chilly temperatures sent us scrambling back to our cozy indoors. On the bright side, we were treated to beautiful views—dramatic, darkened skies punctuated by glimpses of much-craved sunshine. But that was April. 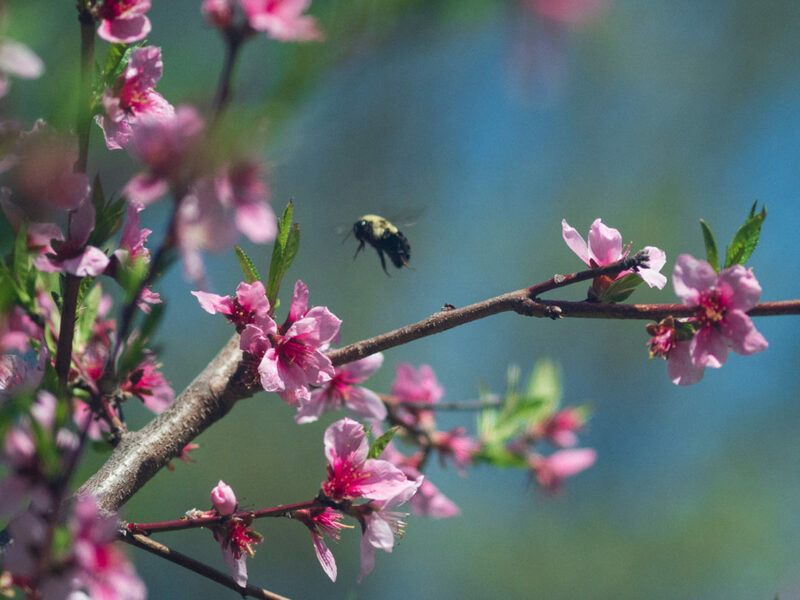 Now it’s May, and springtime is here. A mini-manifesto, and a photo essay you might like. I’m enjoying the peace and quiet, and the sense that I’m not addicted to my iPhone. I miss my friends’ lovely photos and movies, but I’m hoping to find better ways to keep up with people’s lives than seeing them play out against a backdrop of talking llamas selling car insurance, and other inanities greedily vying for a slice of our attention and money. Frank Chimero wrote a superb essay that articulates how I’ve been feeling about the web. In the beginning, the web had such an amazing potential to develop into a public space that prioritized art, education, civic responsibility, and enlightenment. But lowbrow capitalism seems to have outpaced the loftier aspirations of the human spirit. Much of the web is now inundated with ads and other desperate attempts by people to take money from each other. It’s intrusive. It’s gross. And in a way, it’s irrelevant. I’m here for connection with humanity. Won’t you join me? There has got to be a better way. I enjoy the slow, deliberate process of crafting a blog post. I often tell myself that I should do it more often. It’s more like a handwritten letter than an email. More like a slow-cooked meal than a fast-food binge. More like a library than a dollar store. I’ll spend hours writing, editing, reading aloud, preparing visual accompaniment, double-checking everything, taking a deep breath, and then hitting the “publish” button. How often do I put this much care into an Instagram post? I don’t know that publishing here on my independent blog is the answer, nor if it’s going to make any difference in the grand scheme of things. I certainly won’t enjoy the same degree of immediate feedback (likes!) from my audience of friends. But this feels like a small step worth taking—a miniature protest of sorts. A tug in the right direction. Will 2018 be the year that the zombie blog returns from the dead? We will see. Up until recently, there was a dead tree on the edge of my property, leaning toward my neighbor’s land. I needed to figure out a way to bring it down safely and affordably onto my own property. Hiring a professional tree worker would have been too expensive. And I like doing chores like this myself, whenever possible. In order to give myself leverage, I tied a string to a baseball and threw it as high as I could through a place where the tree trunk branched into a “Y” shape. 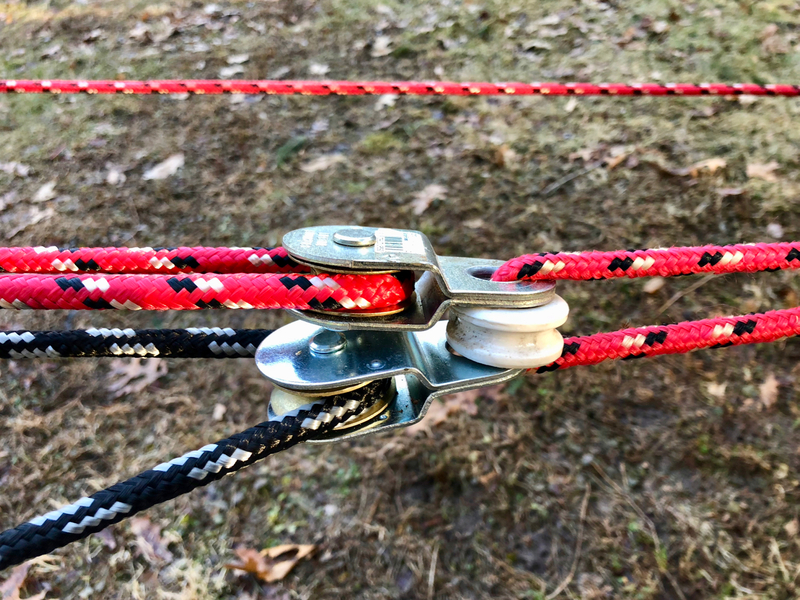 This enabled me to guide a heavier-gauge rope around the tree, midway up. Then I used multiple ropes and pulleys to pull the tree as far as I could toward my yard. Once I had stabilized the leaning tree, I used my chainsaw to make the standard front notch and back cuts near its base. But the final act was a brute tug-of-war, which I documented in the video at the bottom of this post. Playing tug-of-war with a dead tree. I had leverage on my side. 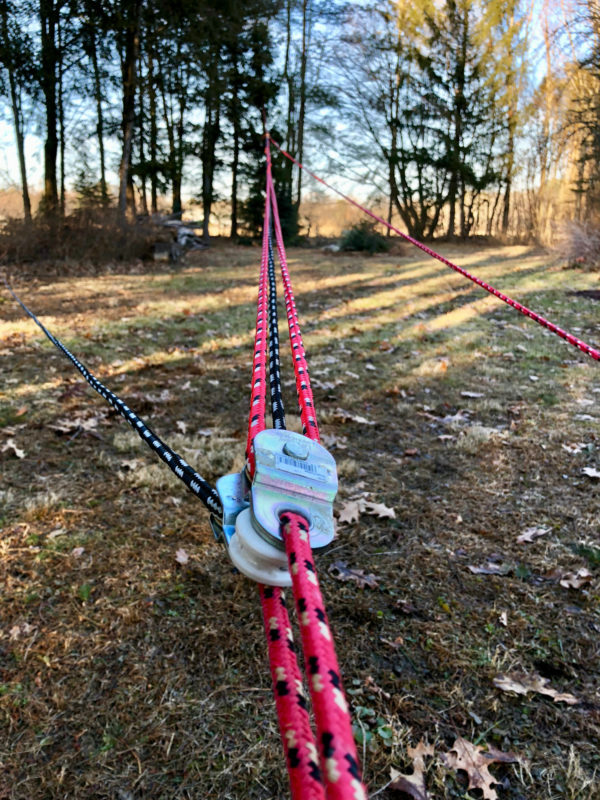 I used a system of ropes and pulleys to multiply the force of my pull. Thankfully, it all worked out. Now I have some cleanup to do. There’s a lot that can be said about the year 2017. I prefer to focus on the positive, and it’s easier for me to do so through images than words. So here’s a gallery of photos I took in 2017. Many of these images I’ve already posted on Facebook or Instagram, but it’s nice to have them all together here in a commercial-free environment. I hope you enjoy them. Recently, for personal enrichment, I completed an online photography course taught by the legendary artist Annie Leibovitz. I am enjoying learning more about photographing people, and I’m looking forward to taking my photography to a new level in 2018. Interested in purchasing prints or a license to republish any of these photos? Get in touch. For a second year in a row, my photos were selected to represent the months of the year in Dave Hayes the Weather Nut’s 2018 Wall Calendar. The photo gallery above shows the chosen photographs. Enjoy. This is one from a series of about 50 “Gocco” silkscreen prints I made in the late 1990s (and one of the few that remain in my collection). The original was a film photo taken by my dear old friend Ben Ostiguy (swimmer4buzzardsbay on Instagram). It’s a picture of yours truly on my bicycle, crossing the bridge over the Connecticut River between Hadley and Northampton, Massachusetts, circa 1991 when much of the Norwottuck Rail Trail had yet to be paved. Ben and I were out gathering photographic imagery for a painting class we were both taking at UMass, and we scouted out the nascent trail off-road style. then down it you go! A few years later I happened to salvage a trove of genuine WWII-era aeronautical maps of Europe that the folks at the W. E. B. Du Bois Library at UMass had been planning to throw out. 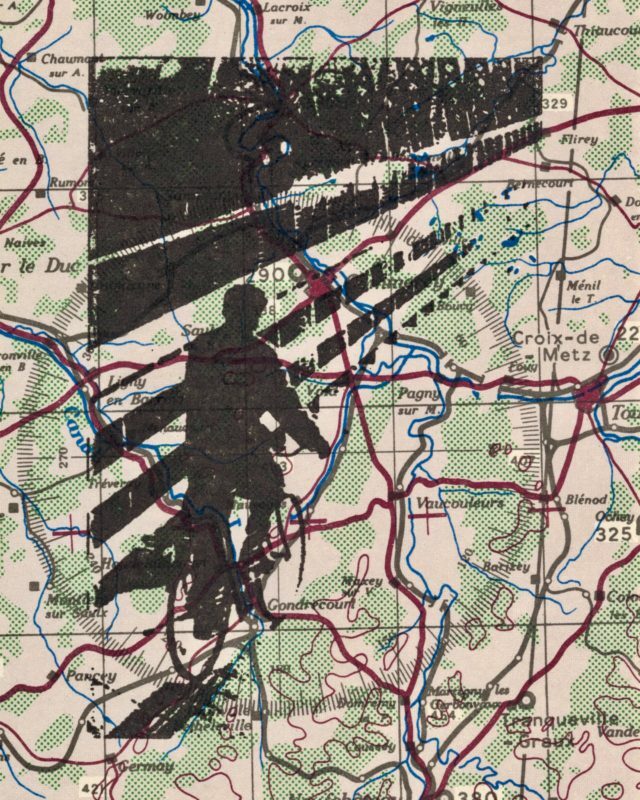 I used the maps as substrates for a handful of collages and paintings. But none of those projects were as successful as this print run, which supplied me with greeting cards for years. I suppose I ought to scan the last two or three I have left, and make some giclée prints. There’s nothing quite like an original, though. The way the ink layers interact with each other and with the paper is hard to reproduce via modern printing processes. I exhibited some of my photographs at Mt. Tom’s Homemade Ice Cream in Easthampton, Massachusetts, October 8th through November 11th, 2016. There was an opening reception on Saturday, October 8th (as part of Easthampton’s monthly Art Walk). I loved seeing you there! I like to take photos involving outdoor scenes, trees, water, earth, and sculpted clouds. These days I share a lot of my work online, but it has been a while since I’ve shown the physical artifacts of the process. When my friend and fellow artist Jim Ingram asked me if I’d like to show my work at his ice cream shop, I said yes. Originally I was going to show paintings. I’ve made a few of those over the past couple of years, but not enough to fill a whole show. Later, I thought that I might show a mix of a few paintings and a few prints. But after reviewing my whole available body of work, I decided to narrow the focus to one medium, and stick to photos. I’m glad I did, because in this case it made for a more cohesive show. The prints for this show were all either 12 by 12-inch squares, or 11 by 14-inch rectangles. Please enjoy the gallery above, which offers a glimpse of the photos that were in the show. Please get in touch if you’d like to buy one. Soon I will be listing them in my Etsy shop. Watch and listen to the video here on this site, or find the song on Apple Music, Spotify, or CD Baby.